In this enlightening talk, Robobiologist Anjali Jaiprakash demonstrates how she has used a robotic vision technology called Light Field to build a retina-imaging device that she hopes will help to eliminate preventable blindness around the world. She also explains the potential of robots that “see” combined with intelligent brains that could lead to exponential improvement in capabilities. As Anjali says “We must always put humans first, but robots will evolve, they will see the world, they will think, and they will act. Robots will perform autonomously and precisely in sensing, diagnosis and treatment”. Indeed, the robot doctor will see you now. 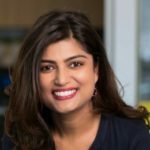 Dr. Anjali Jaiprakash is a Robobiologist working as an Advance QLD research fellow at the Australian Centre for Robotic Vision and Queensland University of Technology. Anjali works at the intersection of medicine, engineering and design, with a transdisciplinary approach to develop medical devices that translate robotic vision into affordable systems that can be used to improve healthcare outcomes. This includes (1) light field retinal diagnostic system to replace the expensive and complex cameras currently used to detect abnormalities such as glaucoma or macular degeneration and decrease preventable blindness using a human-centred co-design approach. (2) Vision-based autonomous robotic technology to perform knee surgery to improve patient outcomes and surgeon training. Through actively embracing novel technologies to solve medical challenges, Anjali’s vision is to create a world in which robotics technology enables affordable medicine for all.